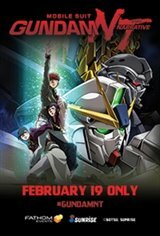 Fathom Events and Sunrise Inc. bring the English dub of Mobile Suit Gundam Narrative to cinemas for one night on February 19. The "Laplace Incident" is thought to have ended. In its final battle, two full psycho-frame mobile suits displayed power beyond human understanding. The suits were sealed away to remove this danger from people's consciousness, and they should now be completely forgotten. However, the RX-0 Unicorn Gundam 03, which disappeared two years earlier, is now about to show itself in the Earth Sphere once more. A golden phoenix...named Phenex. The one-night event will also feature behind-the scenes footage and an exclusive mini-poster (limited quantities, first-come-first-serve).